In Vietnam, tourism is considered as an indispensable trend and a leader in the process of international economic integration, the "smoke free industry" brings about a considerable income for the Vietnamese economy. According to the statistics of Vietnam National Administration of Tourism (VNAT), the number of international visitors coming to Vietnam in 2017 for the first time reached 12,9 million visitors. The number of Vietnamese tourists traveling within the country and abroad also recorded a record 62 million people. Total tourism revenue is estimated at 461 trillion Dong. HI-TEK, Inc. is a privately held Company with offices in San Diego, California, U.S.A., with experience in the field of e-commerce, information technology, Internet and Tourism. 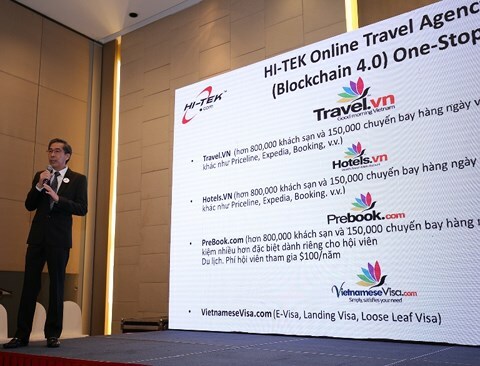 HI-TEK has adopted the Blockchain 4.0 technology to design and develop online booking engine capable of connecting to over 800,000 hotels, providing 150,000 flights worldwide and applying for e-Visa online to Vietnam with the most favorable prices instantly at global network website system www.travel.vn and www.hotels.vn. HI-TEK also offers special rates that our travelers can save up to 75% for members at www.preBook.com. Moreover, HI-TEK also cooperates with the Vietnamese Consulates in the United States and 40 other countries throughout the world to provide online visa registration services to Vietnam, making visa application and issuance process simple, quick, secure and less costly at www.VietnameseVisa.com. HI-TEK will continue to expand its online travel services by further investing, developing and completing the booking platform for cruises, entertainment packages, and car rentals with the best prices to supplement the services offered on our Travel.VN system. The Company is focused to become “the most popular One-Stop-Shopping online travel portal”, and promote the fascinating tourism of Vietnam to the world. In 2018, HI-TEK aims to establish a direct payment gateway to cut down the intermediate costs to maximize the incentives and reduce costs for travelers. The Company plans to promote and market special tourism programs especially directed towards more than 2 million Vietnamese nationals in the U.S. The HI-TEK TRAVEL BANK will offer special travel loans to entice these citizens to visit and experience the beauty of their ancestors homeland. HI-TEK is dedicated to contributing to Vietnam's economy and promoting this charming country globally. We believe with the efforts, determination, creativity of our bright minded employees, HI-TEK's global tourism promotion strategy will yield greater visitors abroad to visit Vietnam. Furthermore, we intend to work cooperatively with the state management agencies, line ministries, and form a strong partnership with the tourism businesses in Vietnam. Together, we will achieve at least 30% growth in visitor arrivals to Vietnam every year, meeting the Prime Minister's directions, and positively contributing to the country's economic growth.